What is the meaning of deep, unspoken connections with people? Answer: Sometimes we have an intuitive connection with people without even saying a word. This can be a déjà vu, when you feel like you know someone and the connection is more like a reunion. “Déjà Vu” is a common intuitive experience that has happened to many of us. The expression is derived from the French, meaning “already seen.” When it occurs, it seems to spark our memory of a place we have already been, a person we have already seen, or an act we have already done. It is a signal to pay special attention to what is taking place, perhaps to receive a specific lesson in a certain area or complete what is not yet finished. However, with these connections, it is very important to determine if the other person reciprocates. You can sense that you are kindred spirits but this must go further than just potential. For good friendships to work, someone’s loving, respectful behavior towards you must back up the sense of connection. If the connection is real, but not actualized, keep moving towards nurturing supportive people. If the connection is mutual, these are precious friendships that can endure through hard times and good. 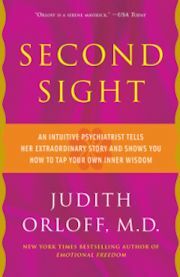 Read my book, Second Sight to learn more about déjà vu and developing your intuition.